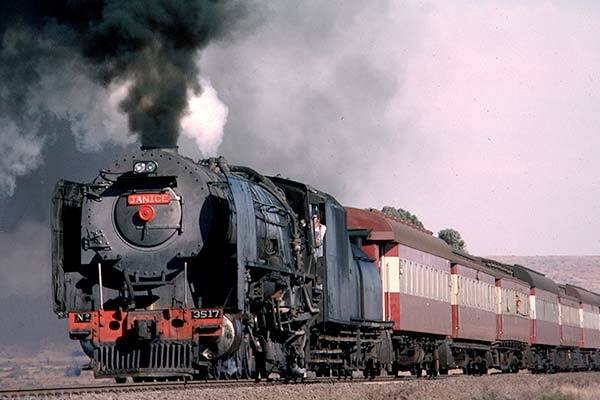 Caption - South African Railways (SAR) class 25 4-8-4 3517 "Janice" makes a magificnet sight as it leaves Kalkbult with the De Aar to Kimberley all stations passenger in June 1978. This loco was formerly a condenser and is paired with one of the converted condenser tenders. Built in 1953 by North British in Glasgow, these modern locos were masters of every duty they were given. On this service on the double track mainline they easily achieved speeds of more than 120 km/h even with heavy trains.